Richard graduated from London Metropolitan University with a BSc (Hons) in Sports Therapy in 2009. In 2014 he was awarded an MSc (Merit) in Sports and Exercise Medicine at The University of Nottingham, which is internationally recognised as a top sports medicine course. He has been treating sports injuries within Cambridge for nearly 10 years and helped over 5000 individuals during this time. Richard has previously spent time at Chelsea FC, Millwall FC, England Ladies FC, the Royal Ballet and the England Cricket Board. He has been involved with Cambridge United FC since 2009 and has worked with all levels of the club and still provides support for the academy and first team. He has also been privileged to have the chance to work abroad, visiting countries including France, Holland, Spain, Germany, Sweden, Portugal, Australia and America. Richard has been called upon to help with two Sport Relief Challenges. Firstly in 2009, Richard had the fantastic opportunity to provide Eddie Izzard with hands-on treatment during his Marathon Man Challenge, where he ran 43 marathons in 51 days. Then in 2014, he treated Jo Whiley regularly before and during her ‘Jo in a Box’ 26 hour treadmill challenge. He was also the live mystery guest on Chris Evan’s Radio 2 Breakfast Show as a sports injury specialist. He has worked with several world class athletes and worked recently with national teams in Lacrosse and Netball. Recently, Rich was privileged to be awarded a scholarship which enabled him to work alongside the Sports Medicine professionals and teams at Duke University in the USA. He has been chosen to be part of the Society of Sports Therapists university liaison group since its inception. This involves providing talks at four universities each year to pass on experience and prepare them for life post-graduation. He has also presented his dissertation findings on core stability at the first Society of Sports Therapists Student Conference. 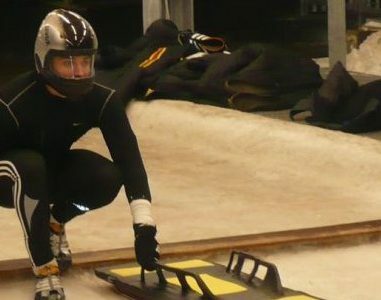 Richard competed for GB Bobskeleton in the Europa Cup Circuit. He trained and competed for 6 years regularly receiving world-class biomechanical screening, strength and conditioning, and coaching. This experience has helped him understand the pressures of undertaking sport at a high-level. To view availability and book an appointment with Rich, please follow the request an appointment tab or the link below.